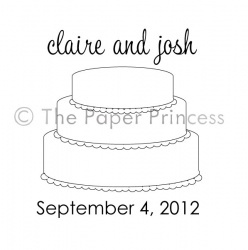 Home :: RUBBER STAMPS :: Custom Wedding Stamps :: Custom Wedding Rubber Stamp: "Claire + Josh"
Custom Wedding Rubber Stamp: "Claire + Josh"
Let friends and family know about your big day in a way that will leave a lasting impression! Simply stamp away, and they'll remember forever! Other info: Stamp image measures 1.75" X 1.5". Image/text is deeply etched into our clear polymer to give you sharp, crisp images every time.